The municipal council of Umeå and the city council of Vaasa have decided to establish a joint company – ”Midway Alignment Ab Oy”. The company shall strive to develop a long-term, sustainable transport and connection solution in the Kvarken region and in the EU. The Midway Alignment of the Bothnian Corridor project has been working on a new transport concept for the past three years. The project’s first phase will be completed at the turn of the year 2015/2016. 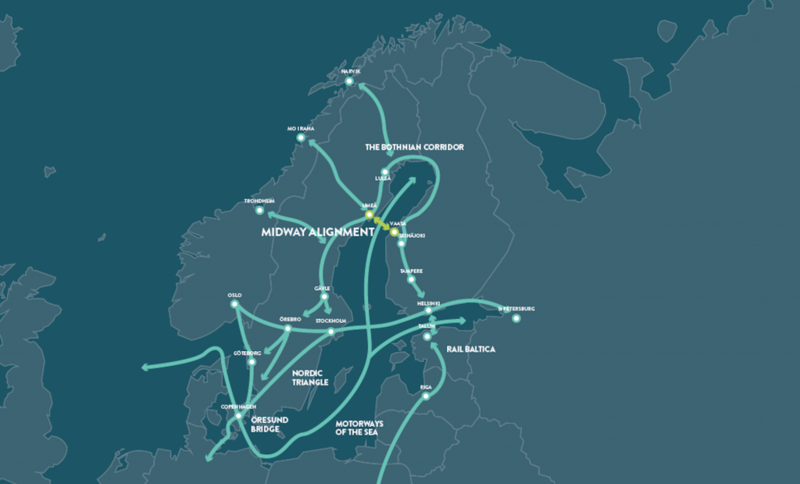 The project was created to improve the connections between strong, rapidly growing and internationally significant regions in the EU, and its goal is to improve the transport system in the Kvarken region and, thereby, strengthen the EU’s transport and communication network for its internal markets (TEN-T, Trans-European Transport Networks). The new company is tasked with preparing suggested transport solutions for implementation. The company matter shall return to the municipal and city councils once more in November for, among other things, the confirmation of the Board of Directors and the Articles of Association. A new EU application regarding the project’s second phase will be completed in the autumn 2015. Suggestions for this phase consist of investments to road and railway infrastructures, changes and capacity increases in the port infrastructures, and the construction of a new ferry. – This is an important and necessary step forward in order to be able to proceed to phase 2. It is also very far-sighted and innovative for two cities in two different countries to establish a joint, cross-border company. Prior examples of the unique cooperation between Vaasa and Umeå include the setting up of the shipping company NLC Ferry Ab Oy (Wasaline) and the port company Kvarken Ports Ltd, says Mr Mathias Lindström, Project Manager of the Midway Alignment of the Bothnian Corridor and Secretary General of the Kvarken Council. The application will be submitted in January 2016 at the latest. If the EU grants support for the project during the same year, the work will begin in 2017 and it is expected to continue until the turn of the year 2019/2020.